After a too-long hiatus from the mountains, I resolved to get back out and get climbing something. I tried and failed to gather some people to go (various schedule conflicts and unexpected blockers), but I wasn't going to let that stop me. Solo hike time. Solo hiking allows a bit of extra freedom, since.... I just choose what I myself feel like doing, and no one is there to say otherwise. 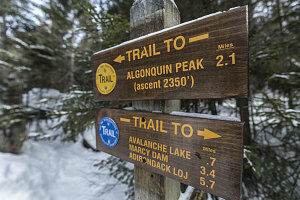 I decided to do something a bit longer and higher today: Algonquin, the second-highest peak in the state, and from South Meadows - a slightly farther and less-used trailhead (and one that avoids me having to pay the rather expensive and denominationally-awkward eleven dollar charge at the ADK High Peaks center parking lot). 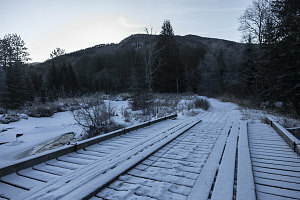 It was one of those days where an oncoming change in weather encourages you to start early - and so I arrived at the South Meadows access road shortly before 7:30 a.m. and quickly made ready to go. Although it was crisp and cool and completely clear right now, the forecast was for overcast by 2pm. 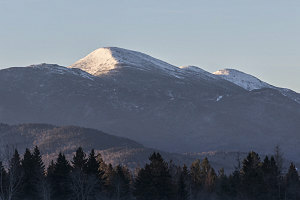 The peaks on the drive in were a beautifully-frosted white in the bright morning sun. 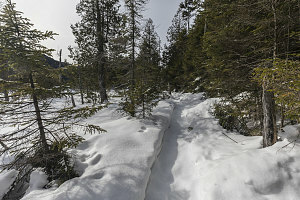 Recent thaws and freezes had melted and frozen away most of the snowpack down here at the 2200-foot level, and the south meadows access road was rock-hard. Snowshoes would have added nothing of value, and I started off bare-booting. 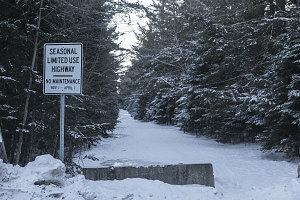 The first 5-6 kilometres (3-4 miles) was a straightforward walk through forest along the South Meadows "Truck" road to the Marcy Dam area - a fire-access route that is closed to vehicles and which serves as a trail when there isn't a fire (which is to say, 99.9% of the time). 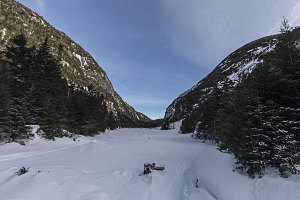 After a quick stop to smell the old tar of the now-dismantled Marcy Dam and to take a nice picture up across the marsh to Mt Colden, I continued on my way, on a still rock-hard packed trail, towards Avalanche Junction and Avalanche Pass. Strangely, I encountered no one along this stretch - I'd have figured that on a clear Saturday morning like this there would at least be a few people about. Reaching the height of land along the trail to Avalanche Lake, the good part of the hiking began: a beautiful walk through the cliffy confines of Avalanche Pass, cool, shady and far removed from the shining morning sun. 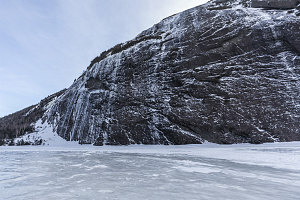 A few easy minutes of slightly downhill trail (still very well packed and still barebootable), I arrived at the northern end of Avalanche Lake - a spectacular narrow finger of water bordered by towering slabs and cliffs. 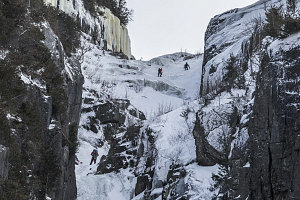 In non-frozen months, the trail through here tortuously winds through a boulder field, full of little ladders and up and down scrambles. 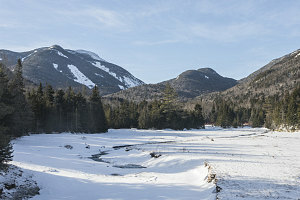 In the winter, though, when the lake is fully frozen, one is able to freely walk down the expanse of the lake, fully experiencing the grandeur of this spot (and expending a lot less energy while doing so). 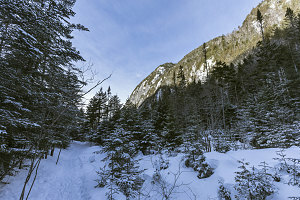 Craning my neck as I walked by, I noticed the dots of climbers high up in the Trap Dike, on Mt Colden's northwest flanks. 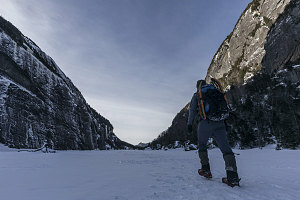 From the southern end of Avalanche Lake, a short bit of hiking brought me to the start of the route up the "back" way to Algonquin Peak. 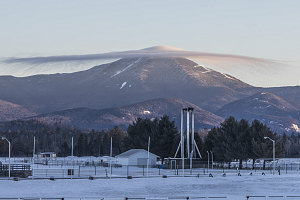 The vast, vast majority of climbers to New York's second highest peak climb it from the northern side, a much shorter distance from the ADK High Peaks Parking lot (than the way I was going). For my extra trouble, though, I had gotten the bonus of the beauty of Avalanche Pass, plus a whole bunch more solitude (in fact, I still hadn't encountered another soul, and it was now 10:30 am.). 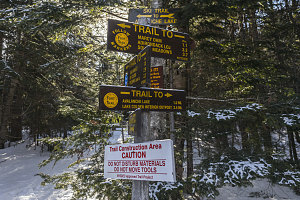 From the Lake Colden area, a steep trail leads up towards the saddle between Algonquin and nearby Boundary Peak. 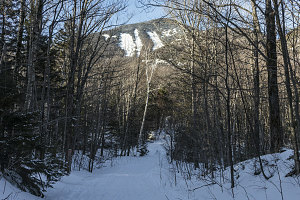 This trail is steep, climbing nearly 2000 feet in less than a mile. 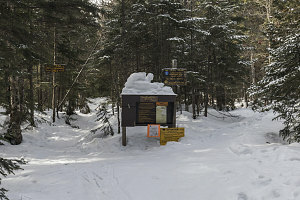 Fortunately, it had been nicely packed out and set (not recently, but only had a thin cover of new snow, so it was still easy to follow). 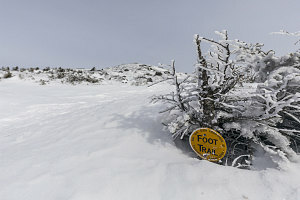 With the increasing elevation, the snow became a bit softer, and I finally switched to snowshoes. 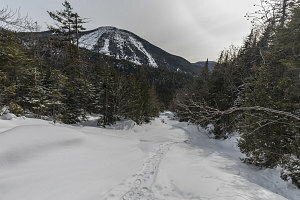 The snowshoe track wound out at times into a nearby brook, providing a nice bit of open ascent with nice views back to Colden. 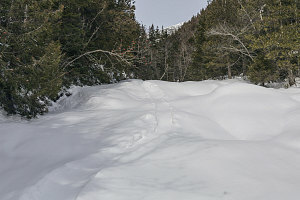 It is often the case that these brooks become beautiful snowshoe highways during the deep snowpack months of the year. 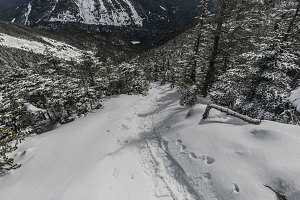 Reminded me a bit of the beautiful open brook ascent of Herbert Brook on nearby Mt Marshall (although a much shorter stretch). I huffed and puffed my way up the 2000 feet to the Algonquin/Boundary saddle, getting fairly sweaty in the process (the sun, though getting weaker through a high layer of approaching clouds, was still beating directly down on this aspect of the peak). 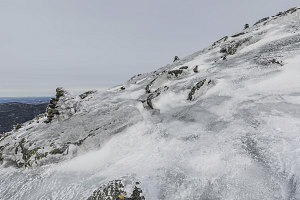 As I neared the saddle, little gusts of wind began to be felt, indicating that above treeline, things might be windy. It was along this stretch that I finally met my first other hikers - a group of three, one of which was hiking with only one snowshoe (the ol' broken-binding-in-the-backcountry problem). 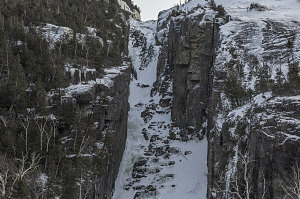 At the edge of treeline, I stopped and observed the snow-and-ice encrusted terrain above. 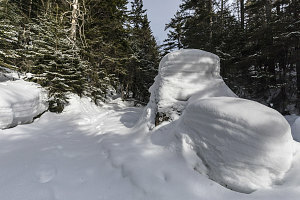 I could see a steady stream of snow blowing across the bare terrain, and knew that I needed to bundle up throughly before heading up. 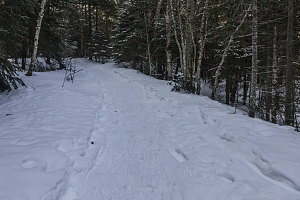 I retreated a little ways down into the trees for a snack of Chips Ahoy cookies and to don some kit. 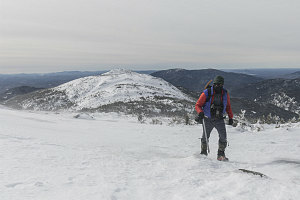 Extra Layers, Balaclava, and face mask in place, I started up, soon emerging into the tundra above treeline. There was a surprising amount of fairly thick ice about, here and there interspersed with a thin hard layer of snow. 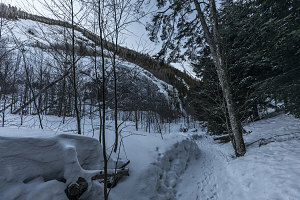 I had chosen microspikes at this point, and with the relatively low angle of the slope here, was able to make progress. Higher up the slope gets steeper, and I no longer felt comfortable with the microspikes, so I exchanged them for my full crampons, getting battered about a bit by the surprisingly strong wind as I did so. Fortunately the actual ambient temperature wasn't too cold, or else there would have been a frightful windchill.